Pillow boxes are one sheet wonders and with this new We R memory keepers tool you can make them easily to fit a variety of items. Whether you tie them top to bottom or around the middle, a pretty bow is about all you need to make it ready to go. Here is the tool that can make pillow boxes of many lengths. It even comes with it's own bone folder and can punch out the finger notch. 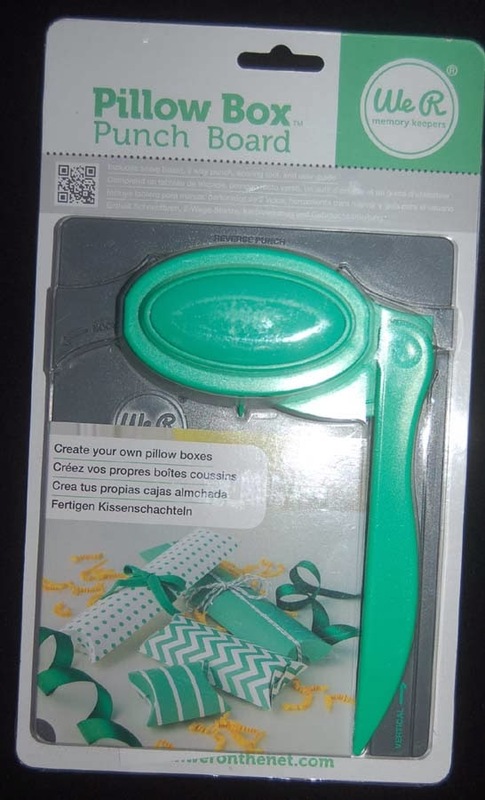 As with the bag punch, this pillow box punch comes with excellent step-by-step instructions. 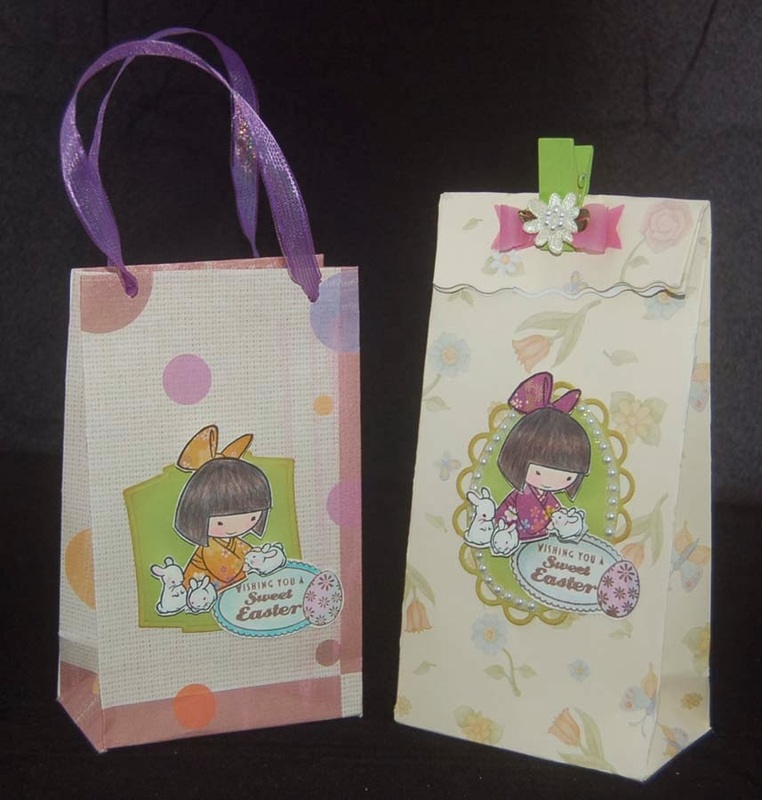 The cute bunnies are Sister Stamps and the funny sentiment is a Studio G product. The banner was made using a Paper Smooches die. Even if you have a pillow box die, you will want this clever punch because it is portable and will help you use up some of your scrap sheets. It will make some cute tiny jewelry boxes. I had so much no-frustration fun with this cool tool that I plan to make a stash of boxes and keep them folded flat in storage so I can pull one out and decorate it whenever I need a quickie gift wrap. You MUST get this punch....put it on your wish list now! Thanks for stopping by....hope you enjoyed reading this post. Leave a comment if you can spare the time. I enjoy hearing from you. Once upon a time I used to make gift bags from recycled wrapping paper. 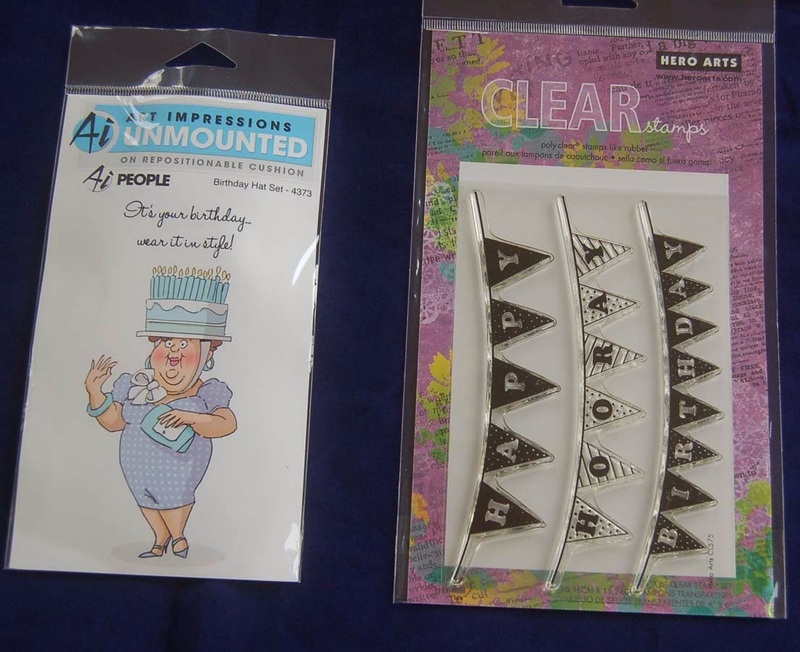 To this day I can't stand wasting pretty paper and so when I found this new gift bag punch by We R Memory Keepers at Ben Franklin Crafts, I immediately put it in my shopping basket. I was worried that I wouldn't be able to figure out how to use the punch because I am mechanically challenged....big time! Good News! This tool is so easy to use (excellent instruction sheet inside) I made a bag on the first try. Here are the bags folded for storage. If you make a bunch of them you will always have quick wrapping ready for a last minute gift. The bags can be made in three widths and various heights. 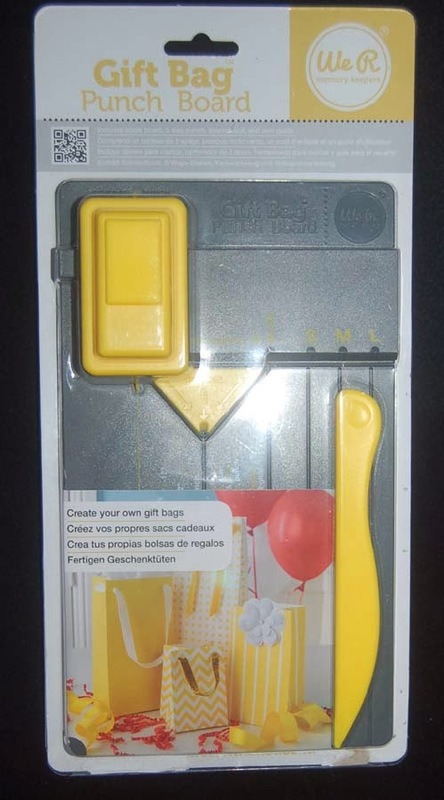 The tool set even has a bone folder and a way to make the holes for the handles. The sweet image is a Sister Stamp that just came out for Easter and can be purchased at Ben Franklin Crafts. The kimono was paper pieced with origami paper. 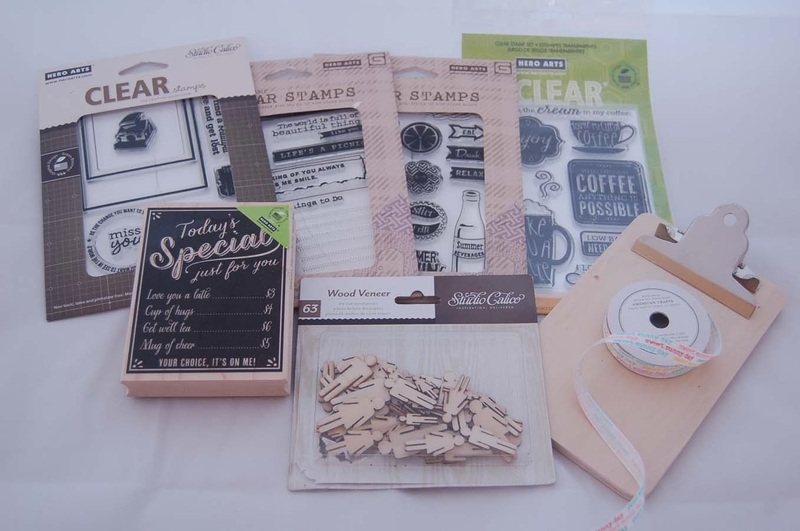 The clothespin (Sierra Pacific 12 pack) closure uses a Tim Holtz die cut vellum paper bow. 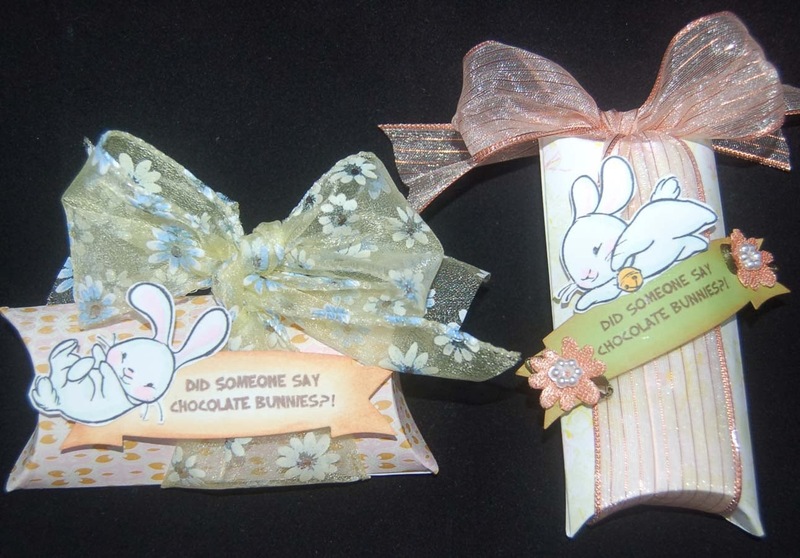 After Easter this decorated clothespin can be used for holding papers, mail, etc. The sentiment is from a Studio G set (not shown in photo)....$1.25 at BFC. The pearl embellishments are from a wedding pack I found in the BFC wedding aisle. The pearls are on an acrylic sheet (must have at least 100) that you can cut and then easily arrange the sticky back string of pearls where you want them. A wavy scissors was used to cut the top of the bag with the clothespin. Okay, that's all for today. Time to make more gift bags.....birthdays coming up soon and this time I'll be ready! After recently seeing many bloggers crafting with stencils, I decided to revisit this technique to make a wedding card. I bought this crane Dreamweaver brass stencil years ago and loved it because of the Escher-like design. Working on watercolor paper I applied embossing stencil paste to the stencil that was taped onto the paper. Once the stencil was filled and leveled, I pulled it off the paper. I sprinkled the raised, wet design with transparent crystal embossing powder. After rinsing off the stencil (the paste will stain it), I applied heat to the crane design with a heat gun. In a few minutes the embossing powder will melt and the paste will be dry. Next I brushed watercolors over the raised design and let the paper dry. Two inch square embossed gold papers (I used wrapping paper scraps) were used to make the folded the cranes. Finally a punched out blue vellum circle and the cranes were attached to the stenciled paste embossed panel. I decided I wanted a less colorful card for the wedding so I did a version 2. This card was easier to do because it didn't involve the embossing paste. 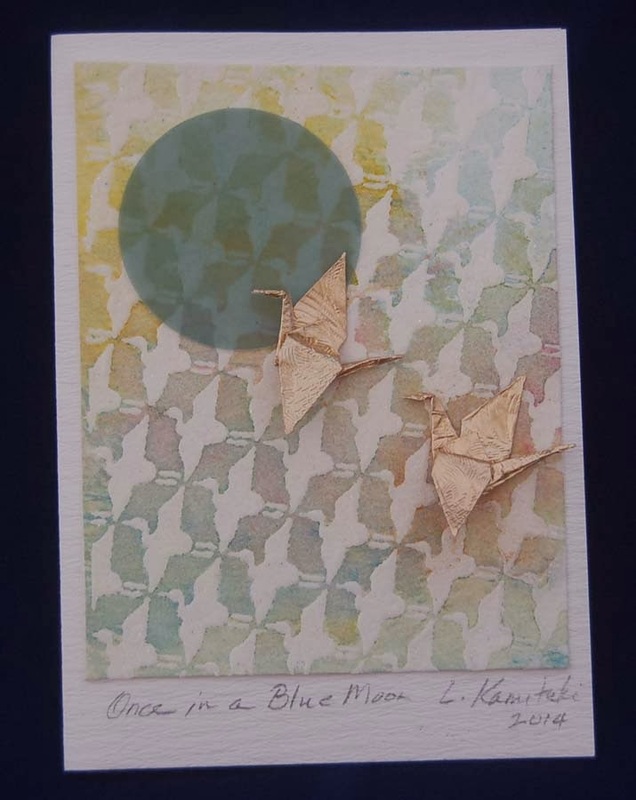 I simply embossed the crane stencil onto a washi paper (with encased real leaves). 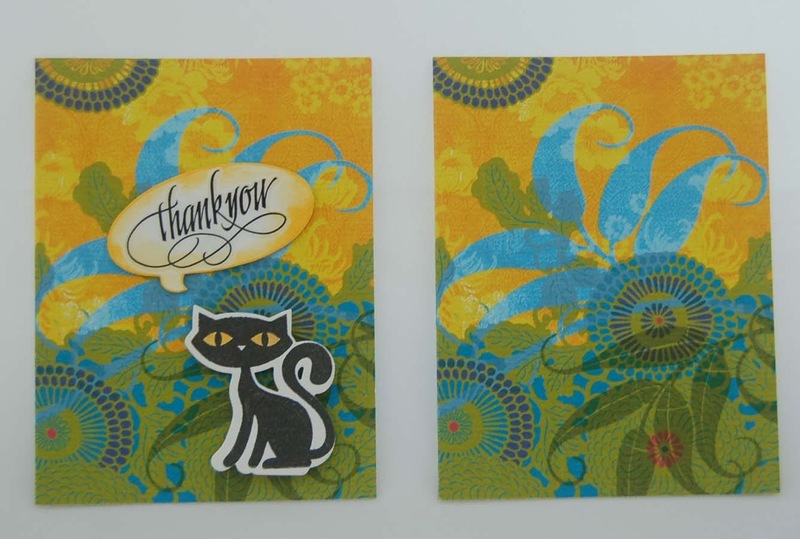 I used an embossing plate and embossing pad in my Big Shot to quickly achieve the look without tediously hand embossing. Washi paper is very fibrous so to achieve the torn bottom edge I applied a little water (with a small paint brush) where I wanted the paper to tear. 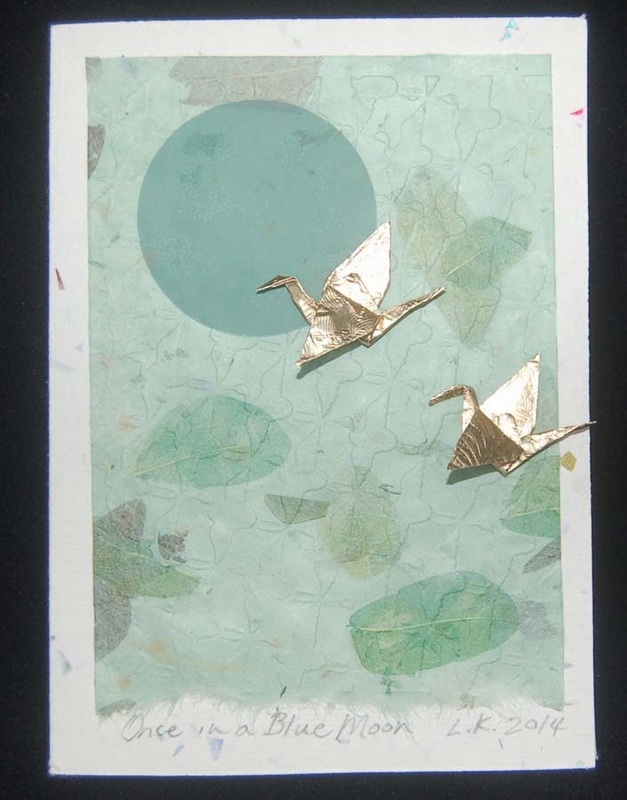 Sorry, the photo of the second card doesn't clearly show the embossed cranes but IRL the subtle effect is lovely. I'm not sure which version I like better, but I am pleased with the outcome of both cards. What do you think? 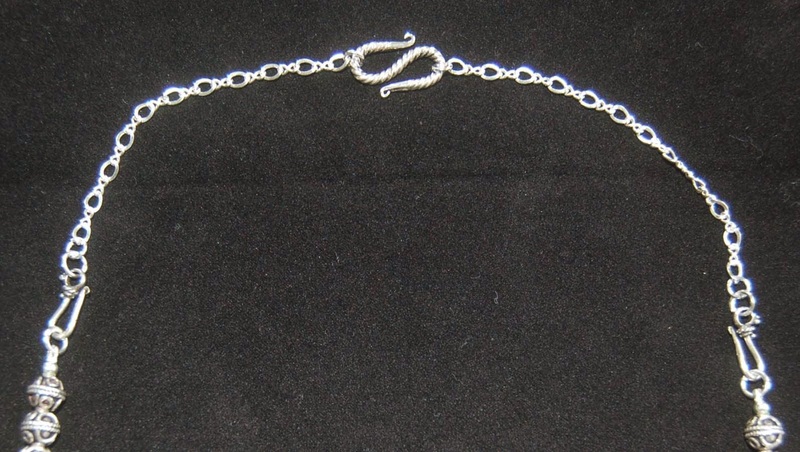 This is a necklace that I made several years ago (not sure if I wrote a post about it). 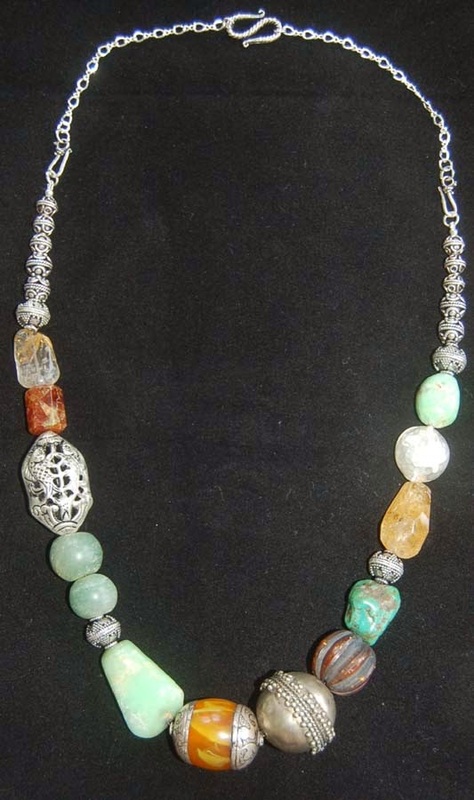 I really like the look of it but the length of the necklace made it difficult to wear with many outfits. The solution was to make extensions with chains, jump rings and hooks. I think the resulting necklace has more balance and is more wearable because of its length. Also I can still easily convert the necklace into the original one by simply unhooking the extensions. 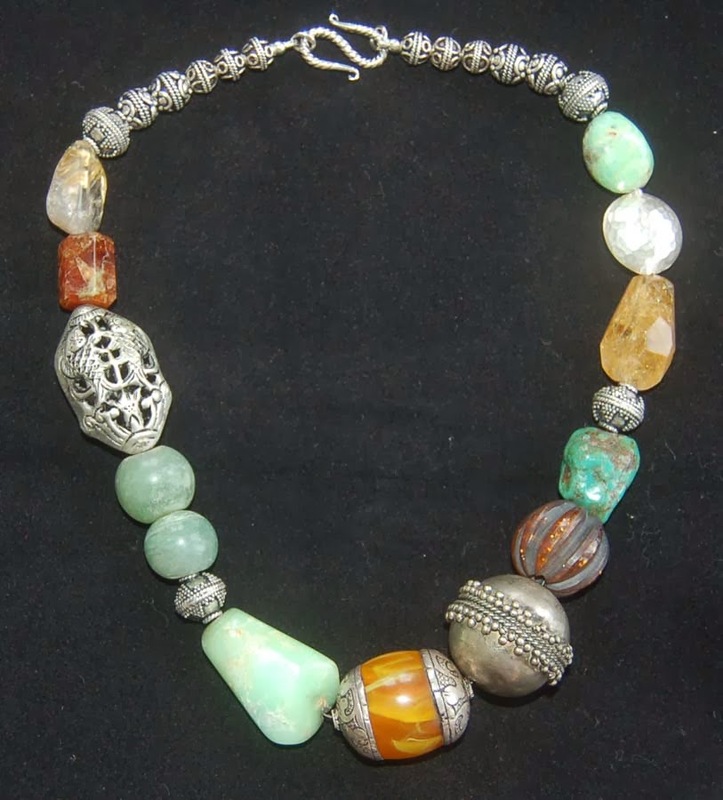 I hope this quick fix for lengthening a necklace is something you'll try to double the life of your favorite jewelry. Happy Crafting! Sorry that I haven't commented on too many blogs recently because we were traveling again. I did read and enjoyed what I saw. Upon returning home I had many thank yous to send out to those who treated us well during our trip and to those who took care of things at home for us. 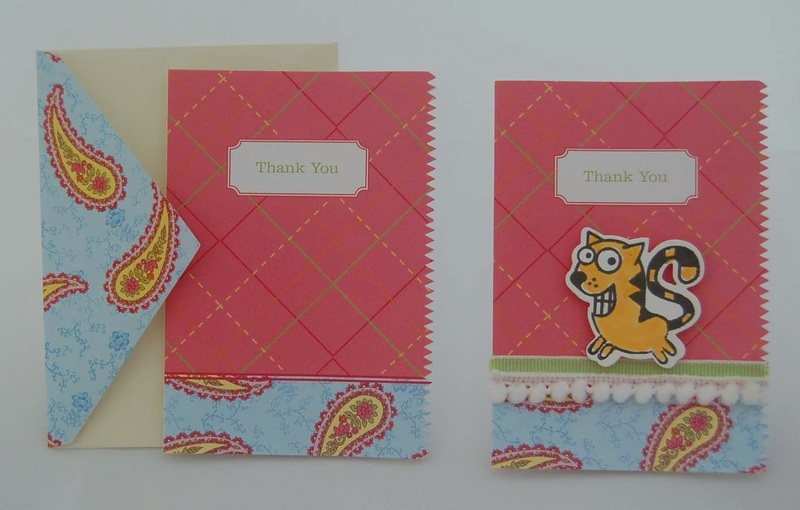 To speed up the production of thank you cards but still make them a bit handmade, I sometimes begin with a store-bought card.....what????? Yes, I know this seems like cheating but sometimes there are boxed sets selling for less than blank cards and envelopes. I look for the boxes that contain cards that need just a little tweaking. 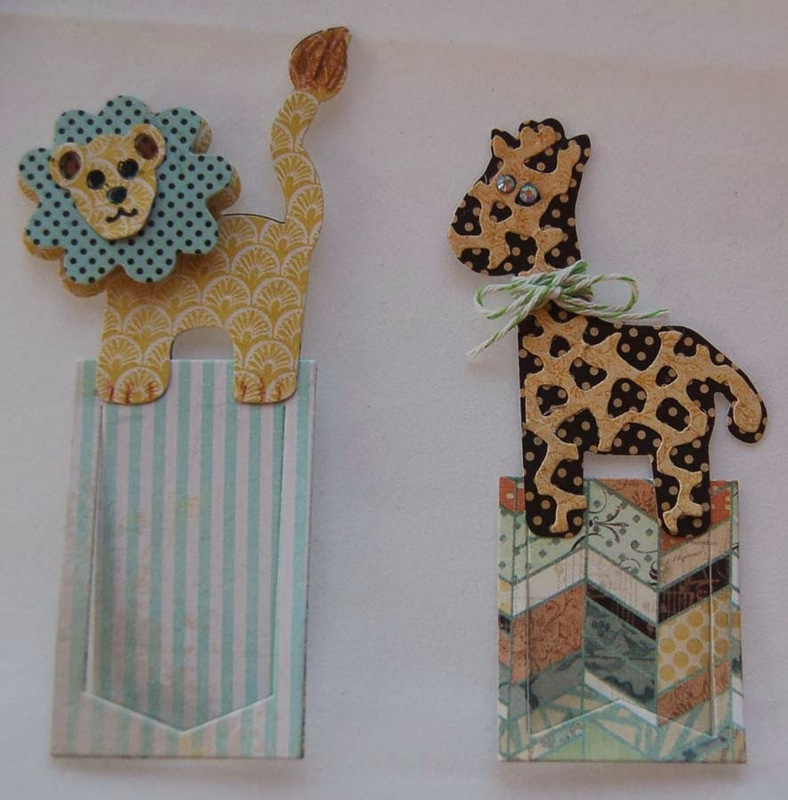 The examples shown required very little work....just some stamping and die cutting or gluing. The cats are from a Paper Smooches set as are the dies. 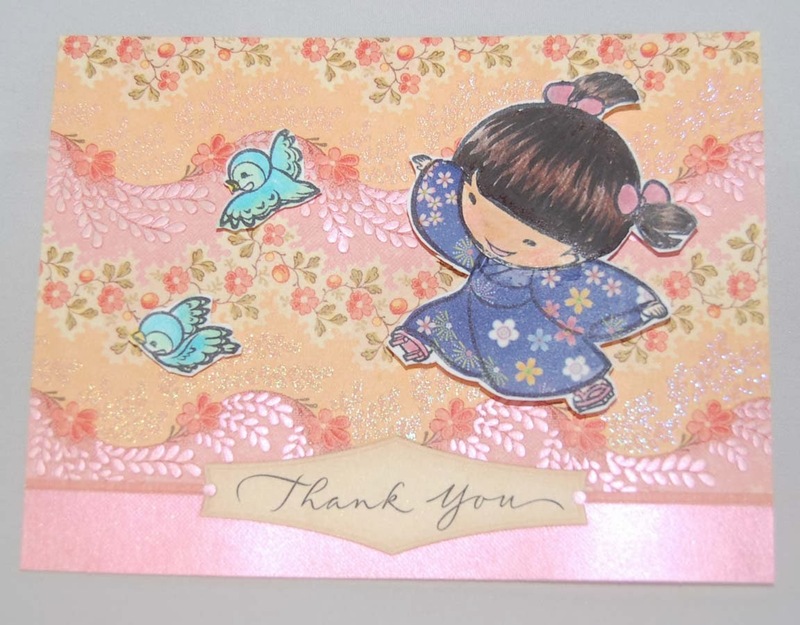 For my favorite embellished ready made card, I used a Sister Stamp and paper pieced her kimono. Congratulations to clever Niki G who was the fastest to comment in with my correct birth date....Feb. 26th! She chose the Hero Arts birthday banner set. The second person with the correct date was Lee Yonaoshi. Lee, if you see this please send me your mailing address via my email address (lsakami@aol.com) and I will send you the AI birthday set. ( I do not have any way of contacting you.) Congratulations again to Leanne for being the winner of the random drawing for the BFC $25 gift card. February was my birthday month and so to celebrate I am picking a gift card winner from the comments left on my blog posts in the month of February. As I do occasionally, I randomly choose one comment and send the person who sent it a Ben Franklin Crafts gift card. This time the lucky winner is.....Leanne! who writes the wonderful blog, Finding My Groove. Congratulations! Leanne, please send your mailing address to me via my email address (lsakami@aol.com). To further celebrate my birthday I have decided to give away the two stamp sets in the above photo. The first two people to correctly identify my birth date (year not needed) will each win one of the sets. (The first one sending a comment with the correct day and month will have first choice.) The winners will have to send me their mailing address via email. I don't think any of my regular blogging friends know my birthday so here's a hint: It's the same day as Dr. Oz's daughter, Daphne's new baby daughter. Daphne is a co-host on the ABC daytime show, The Chew. Good Luck! Because I firmly believe that it is of utmost importance that we as a society teach our youths the love of reading, I almost always give a gift of books to children. Making a cute bookmark to go with gift books may further encourage a child to read and mark their place. 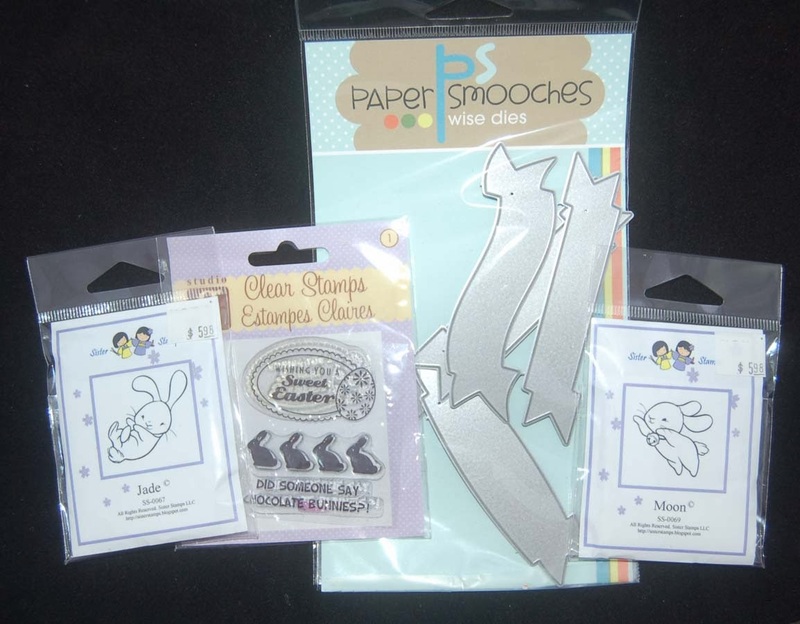 Coupling the new animal Sizzix dies with the Paper Smooches bookmark dies is an easy and quick way to make an attractive children's bookmark. The animal die sets seemed to have more parts than I needed or wanted. I kept the animals simple and drew in the lion's face and tail tuft. I also added two flat-back crystals for the eyes of the giraffe and tied some twine around his neck for extra texture. (Tip: Since the die sets had some very small parts I put them in a Ziploc baggie before storing them in the plastic storage envelope that came with the set.) I glued all the parts together with 3 in 1 Beacon glue except for the intricate giraffe pattern which I ran through my Xyron sticker maker before adhering to the giraffe base. 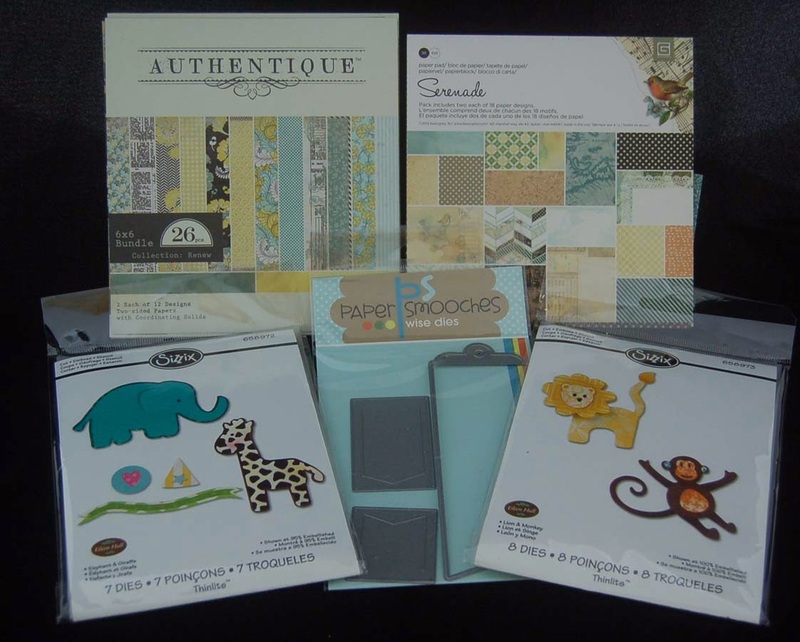 The Basic Grey and Authentic 6x6 packs make choosing coordinating the papers for the bookmarks super easy because just about every paper in the pack works together. Since the paper wasn't quite sturdy enough for a child's bookmark, I cut two of each animal base and two of each bookmark and glued them back-to-back. I hope that you'll give children books instead of electronic toys. Better yet, I hope you'll give a child a book AND read it to him/her. Regular book reading will create a lifetime of memories. 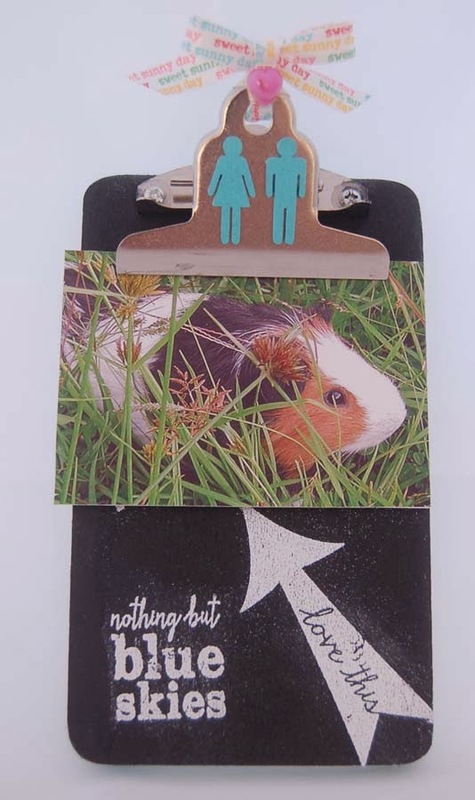 Chalkboard Clipboard for Displaying Photos, Holding Memos, Saving Coupons, Etc. I was so impressed by all the chalkboard/blackboard projects at the CHA show that I had to try my hand at it. First I bought an unpainted wooden clipboard from HouseMart Ben Franklin Crafts and painted the front with blackboard paint (also from BFC). Once it was dry, I stamped the designs with white Versa Magic ink and dusted each image with white embossing powder before heat setting it. 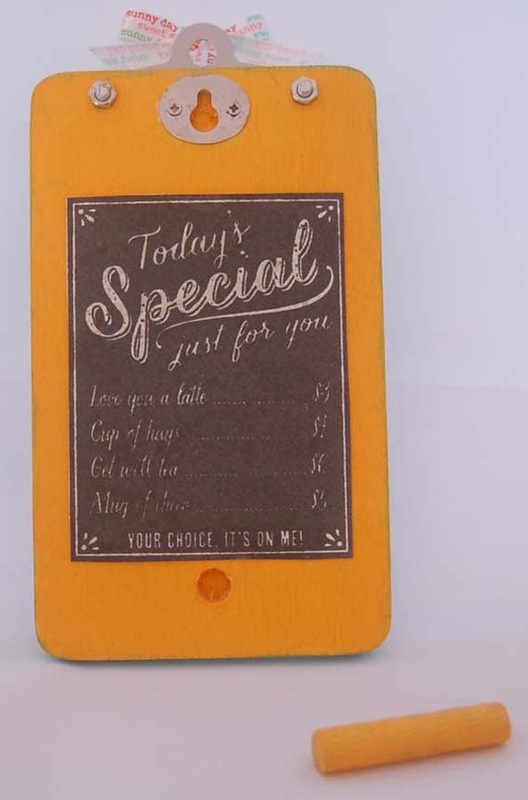 Don't worry about the little specks of embossing powder that remain on the clipboard because they will make the chalkboard effect more realistic. 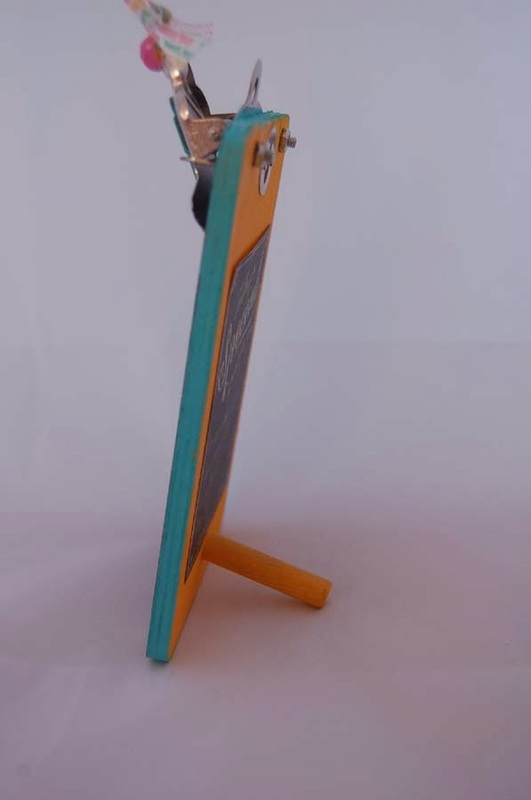 You can use this clipboard to hold whatever you choose and hang it up using the hardware on the back. I painted the edge of the clipboard and wooden people pieces (Studio Calico) (purchased at BFC) the same beautiful aqua color and tied on an American Crafts ribbon (from the jumbo pack sold at BFC). TIP: I would recommend painting the lighter colors first just in case a misplaced brush stroke requires clean up; it is much easier to paint dark over light. I'm sorry that I did not include the paint bottles in the photo below but I'm too tired to retake the photo. This was such a satisfying project that I am looking for other wooden pieces to turn into chalkboard surfaces. 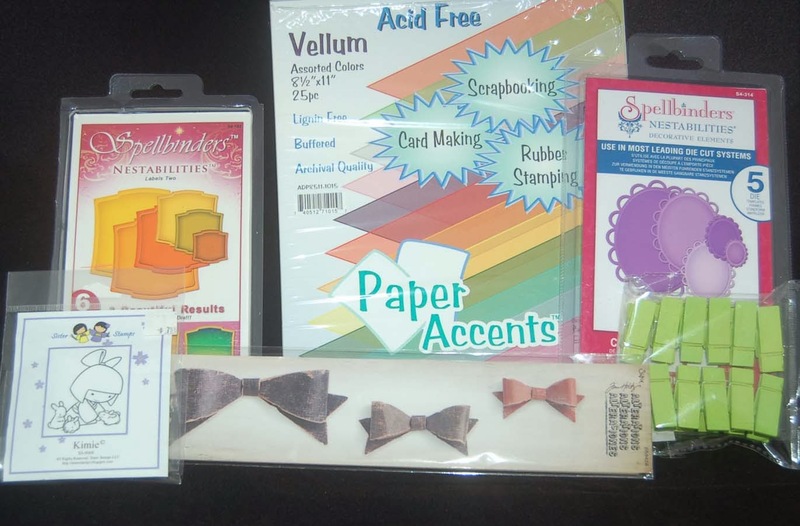 Crafty fun ahead! I just got some Marvy Uchida chalkboard markers and tried them out on the clipboard. I think they look fabulous and the colors wipe off with a damp cloth. 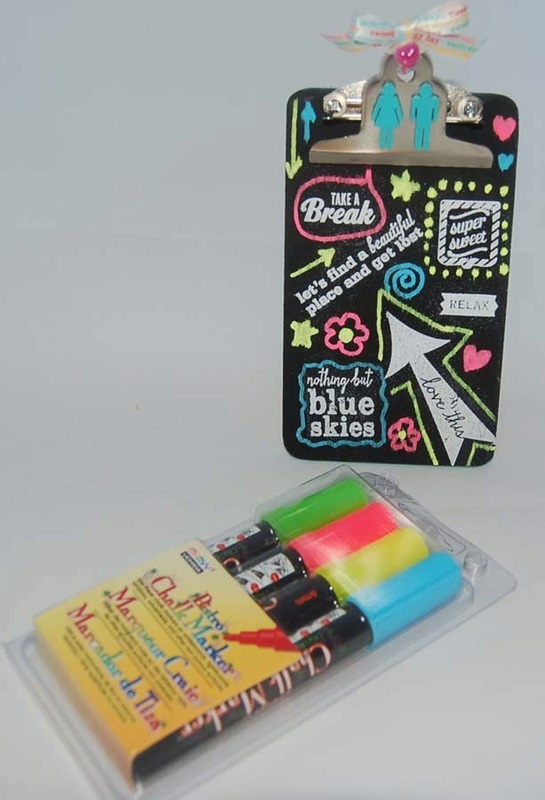 With these markers and the chalkboard paint you could even just do a plain chalkboard clipboard for a party favor. Kids and adults will love these!